GUANTANAMO REDUX ($15: Softcover ISBN-13: 978-1-68114-299-9; $30: Hardcover ISBN-13: 978-1-68114-300-2; $2.99: EBook ISBN-13: 978-1-68114-301-9; LCCN: 2016919184; Release: April 15, 2017; Purchase on Amazon or Barnes & Noble): uses the techniques of speculative fiction and science fiction to create a dystopian vision of the near future in America. Here, most any kind of dissent is criminalized and individuals are routinely charged with terrorism offences. The L. A. Mercy Killer is incarcerated in the Bay of Frisco, a center for domestic terrorists, after the third terror has destroyed much of Los Angeles. Special Agent Orwell and Judge Dan believe the girl whose face you can’t see was deeply involved in not only the Mercy Killer’s crime, but, also, the massive terror attack on Los Angeles. In Part II of the novella, a flashback, we retrace the steps of the girl whose face you can’t see prior to the third terror. Who is she and what does she represent? Did she know the L.A. Mercy Killer? Was she responsible for his crime and for her own? The conclusion of the novella is a chilling expose of how conformity and authoritarianism threaten freedom, imagination, language, life and limb. The L.A. Mercy Killer stands in the long tradition of dissidents who rage against the security state. A Brief History of Summer Employment: ($15: Softcover ISBN-13: 978-1-68114-338-5; $30: Hardcover ISBN: 978-1-68114-339-2; $2.99: EBook ISBN-13: 978-1-68114-340-8; LCCN: 2017940877; Fiction—Literary; Release: November 1, 2017; Purchase on Amazon or Barnes & Noble): is a fictional memoir that unpacks blood sport in the marketplace. The narrator finances many years of post-secondary education by taking summer jobs of dizzying variety. As he documents his experiences, he becomes porte-parole for a generation in the grips of precarious work. More broadly, however, he illuminates personalities of intriguing emotional and psychological complexity in circumstances that are obviously or discreetly desperate. These are dispatches from the front lines, stories that present an ironic and critical portrait of economic activity and human imperfections. Adversity and anguish burn in the atmosphere as do humor and heroism. The workplace is a dangerous environment to earn a living. TrumpeterVille: (Softcover: $15, 46pp, 6X9″: ISBN: 978-1-68114-379-8; Hardcover: $30: ISBN-13: 978-1-68114-380-4; EBook: $2.99: ISBN-13: 978-1-68114-381-1; LCCN: 2017954155; Satirical Novella; Release: December 15, 2017; Purchase on Amazon or Barnes & Noble): is animal allegory in the tradition of Animal Farm by George Orwell. The story reflects American political culture before and during the presidency of Donald Trump. The new leader of the lake nation of Swanville, simply called the Trumpeter, promises an ambitious agenda. He will dismantle the Swan Care Act of his predecessor, President Lulu. He will drain the Swamp where the left wing oligarchy eat the very best protein and vegetation. He will increase shoreline habitat by bringing down the beaver wall on the North River. And he will ban migratory birds from Swanville because they are looters and moochers and not part of the Great Swan’s plan. Eventually, the new president becomes cob-in-chief of a nation at war with its neighbors and itself. TrumpeterVille is political satire that wags a cautionary tale. Dean Gessie was born in Thunder Bay, Ontario. He enjoyed a long career as Head of the English Department at Pickering College in Newmarket, Ontario. While there, he was also Director of the award-winning Joshua Weinzweig Creative Writing Program. Gessie won Honorable Mention in the Press 53 Novella Competition. Gessie’s story, “Nobody Knows How Much You Love Him”, won the short story prize in Bacopa Literary Review’s 2018 international contest. Also, one of his short stories was selected to the list of Highly Commended Stories in the international Manchester Fiction Prize. Most recently, Gessie published Guantanamo Redux, dystopian fiction about the near future in America and the byzantine complications of survival in an authoritarian state. Gessie has also written and served extensively as a social justice activist. September 15, 2016. Ralph Crosby did a reading from his book, “Memoirs of a Main Street Boy: Growing up in America’s Ancient City,” at the historic, colonial Maryland Inn’s Treaty of Paris room in Annapolis, MD. September 22, 2016. Ralph Crosby did a book reading and signing at Back Creek Books, the major local book store in Annapolis, MD. 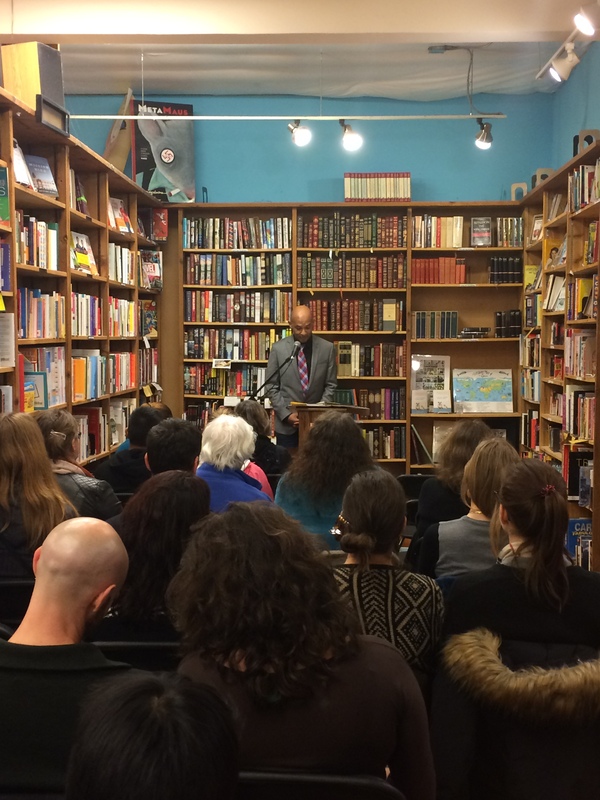 January 7, 2019, Monday, 7pm: Mark Schlack and his collaborator, Ephraim Weisstein, discussed Replay Earth (Anaphora) at Trident Booksellers & Café on Boston’s fashionable Newbury Street: 338 Newbury Street, Boston, MA 02115. October 4, 2018, 7pm: “Ben Soltzfus: Falling and Other Stories”: Reading will be followed by light refreshments and book sales and signing. This event is free and open to the public. Inlandia’s Arts Walk for Book Lovers at the Main branch of the Riverside Public Library: 3851 Mission Inn Avenue, Riverside, CA. March 26, 2015, 11-12:15pm: Two of Anaphora’s poets, Laura Madeline Wiseman and Janet Heller presented in the “Dramatic Monologues in Current Poetry” session of the College English Association, 2015 convention: Regency C, Hyatt Regency Indianapolis, 1 South Capitol Avenue, Indianapolis, IN 46204. August 10-12, 2018: Luvaas accepted the Best Adapted Screenplay Award from the Golden State Film Festival for his artistic book trailer for Welcome Home: Los Angeles, CA. March 20, 2018, 3pm: Book signing at Skylight Books, Los Angeles, 1818 N Vermont Ave, Los Angeles, CA 90027. April 6, 2018, 5:30-6:30pm: workshop; 3-5pm: reading: Workshop & Reading: San Diego Writers Ink, Arts District of Liberty Station. April 21-22, 2018, 12-2pm: Book signing: Los Angeles Times Festival of Books: Anaphora Literary Press Booth. May 10, 2018, 7:15pm: Reading: Why There Are Words Literary reading Series, Studio 333 Sausalito, CA: http://www.whytherearewords.com/2018/04/17/why-there-are-words-sausalito-presents-return-may-10-2018/. TBA: Reading at Living Writers Reading Series, San Diego State University. March 8, 2018, 3-5pm: West Virginia State Museum: 1900 Kanawha Blvd., East Charleston, WV 25305: Duff signed copies of his Anaphora novel. February 27, 2018: West Virginia House of Delegates: 1900 Kanawha Blvd., East Charleston WV 25305: Duff’s novel, “A Dying Breed” was recognized by Delegate Kayla Kessinger, and placed into the West Virginia State Archives. May 9, 2018, Wednesday, 6:30-7:45pm: Reynolds reads from his novel at the Russell Library, Hubbard Room, 123 Broad Street, Middletown, CT 06457 in conjunction with Wesleyan University. June 14, 2017, 6:30-9pm: Reading at the Dublin City Library & Archives, Dublin, Ireland: http://www.dublincity.ie/dublin-city-library-archive. April 29, 2017, 3pm: Book Signing and Concert: Silverlake Public Library, 2411 Glendale Blvd., Los Angeles, CA 90039. May 13, 2017, 3:30pm: Book Signing: Barnes & Noble: 26751 Aliso Creek Rd., Aliso Viejo, CA. 92656. September 16-23, 2019: Clifford Browder will exhibit at the Brooklyn Book Festival, featuring two Anaphora books, “Bill Hope” and “Dark Knowledge”. Brooklyn Borough Hall and Plaza, 209 Joralemon Street, Brooklyn, NY 11201. February 5-6, 2019: Canadian Anaphora author Dean Gessie will visit Pickering College at 16945 Bayview Ave, Newmarket, ON L3Y 4X2, Canada. The contact person for that event is Keith Kupsch who can be reached at kkupsch@pickeringcollege.on.ca. 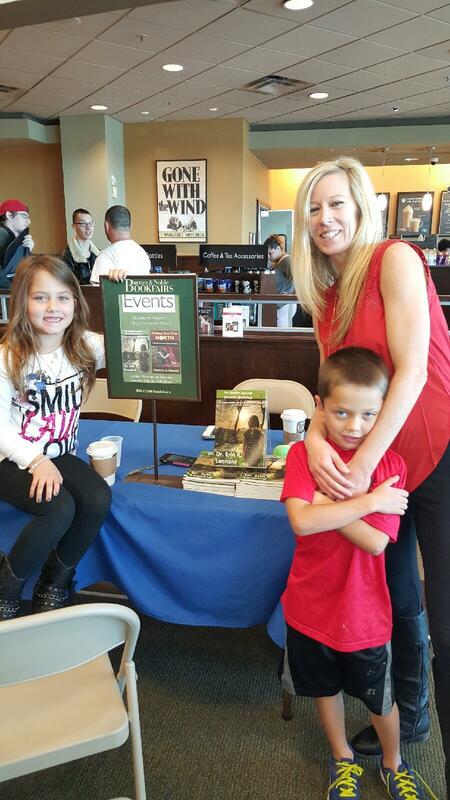 October 10, 2015, 12pm: Dr. Leonard did a reading at a Barnes and Noble. 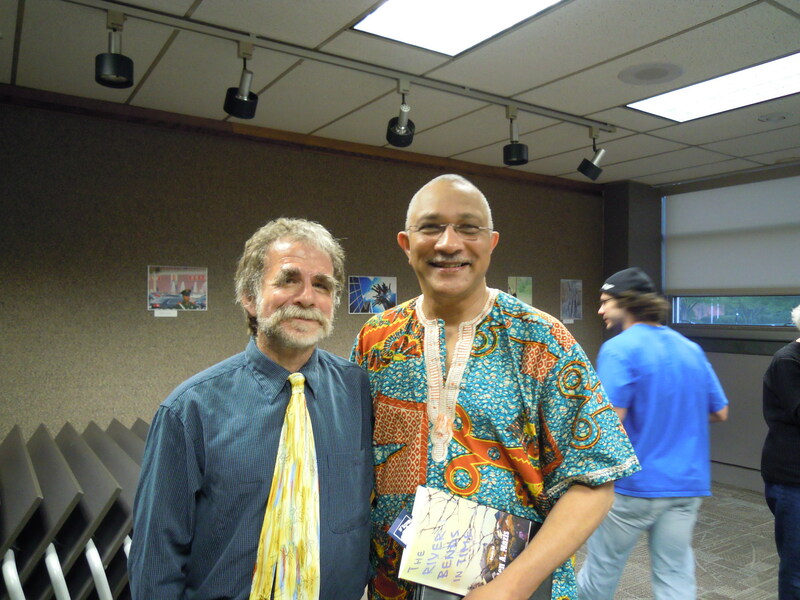 April 17, 2015, 6pm: Dr. Leonard will read at the Barnes and Nobles at University Mall in Mishawaka, IN. 9/30/2016, 12-2pm: Keith Moser will sign books during the inaugural symposium of MSU’s Department of Classical and Modern Languages and Literatures: The Mill at MSU Conference Center on Russell Street: https://www.cmll.msstate.edu/symposium/index.php. May 26, 2016, 3:30-5pm: Moser presented a paper called, “Biological and Semiotic Marking of Human Space in Michel Serres’s Interdisciplinary Philosophy” in the Learning to Dwell panel at the Eleventh East-West Philosophers’ Conference, Imin Conference Center, Honolulu, Hawaii. November 21, 2014, 6:30 PM at the monthly Coffee and Couplets poetry night at the Four and Twenty Cafe, 420 S. Main St., Princeton, IL. 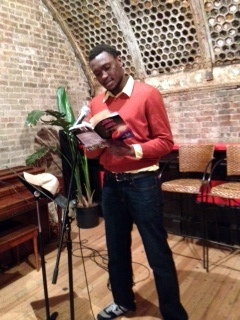 Stewart will read a few selections from the book and members of the audience are welcome to read their poetry as well. There will be refreshments. This will be the book launch celebration for Stewart’s Anaphora poetry collection. December 21, 2014, Sunday, 2-4pm: Joan will read from her Anaphora poetry collection at the “Voices of Poetry” event at the Hunt Hill Farm Trust, 44 Upland Road, New Milford, CT.
March 7, 2013, Thursday, 3 PM – 4:15 PM: Susana is participating in a panel at AWP Boston on “The Chapbook as Gateway”: Room 108, Plaza Level R222. The Chapbook as Gateway. (B.K. Fischer, Stephanie Lenox, Lyrae Van Clief-Stefanon, Susana H. Case, David Tucker) Four poets who have published with Slapering Hol Press, one of the oldest chapbook presses in the US, discuss the vital role the chapbook plays as a threshold to further publication and literary accomplishment. The recent popularity of the chapbook invites examination of the challenges and promise of the form, the opportunities it affords for emerging poets, its role as a creative bridge to the publication of a full-length book, and the renaissance of artisanal book-making. March 9, 2013, Saturday, 6 PM with others, Lir Pub, 903 Boylston St., Boston, MA. March 23, Friday, 6 PM with others, Cornelia St Cafe, 29 Cornelia Street, New York, NY. 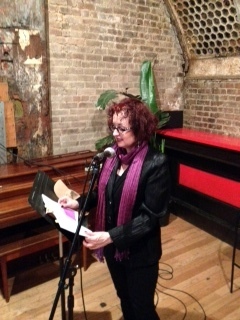 April 15, Monday: Susana will read with other poets at The English Speaking Union of New York, 144 East 39th St., New York, NY. April 18, Thursday, 8 PM, with others, Boundless Tales Reading Series, Waltz Astoria, 23-14 Ditmas Blvd, Astoria, NY. May 7, Tuesday, 7 PM: Susana will read at Women Write Resistance: Poets Resist Gender Violence, with other Women Write Resistance poets and Doll Parts, a Dolly Parton tribute band, at KGBBar, 85 E 4th St., New York, NY. May 10, 2013, Friday, with Jessica Greenbaum, Hudson Valley Writers’ Center, 300 Riverside Drive, Sleepy Hollow, NY. May 12, Sunday, 4 PM with Mervyn Taylor at Lunar Walk Poetry, Two Moon Art House & Café, 315 Fourth Avenue, Brooklyn, NY (Park Slope). 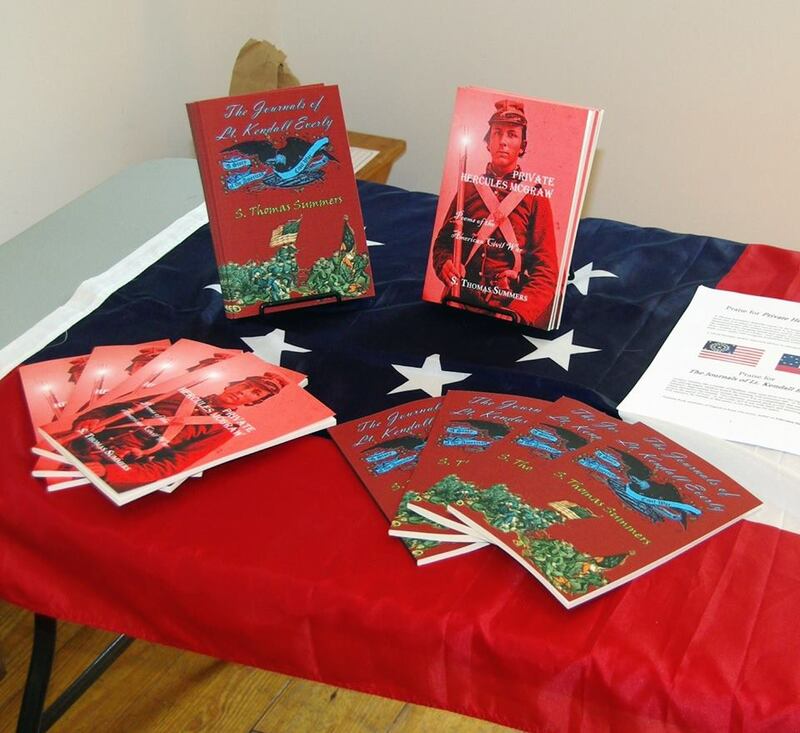 May 17, 2014, 4 PM at Water Street Books at 26 Water Street, Williamstown, MA, author reading and signing. June 12, 2014, at Gibson’s Bookstore at 45 S. Main Street, in Concord, NH, reading and signing at 7 PM. February 21, 2013, Thursday: The Puerto Rican writer, director, producer, Miguel Parga, returns to the island after acclaimed success in Los Angeles and New York, to present to the public his first novel in English, Blood Laws. The official presentation will be at, Libros AC Bar and Bistro. (1510 PONCE DE LEON AVE., SAN JUAN, PR 00909 / 787-998-5130, 787-998-5132). For more info: https://www.facebook.com/events/547276121963647/. March 15, 2012, 3-5pm: Penn State Harrisburg – 2012 Celebration of Author’s Book Signing – Gallery Lounge, Olmsted Building, Middletown, PA.
April 4, 2012, 6-7:30pm: Glen Mazis reading of poetry from The River Bends in Time, at the Gallery Lounge, Penn State Harrisburg, Middletown, PA 17057. April 14, 2012, Saturday, 6-7:30pm: The Wise Owl Bookstore, 624 West Penn Ave., West Reading, PA 19611. April 25, 2012, 7:30pm: Lancaster Poetry Exchange, Lancaster, PA — Poetry reading and book signing. April 28, Saturday, 4-5 PM — Poetry Reading with book signing to follow sponsored by Dorot Senior Outreach Program, 303 West 66th Street, NYC. May 5, 2012, 8pm: Performing poetry in Spoken Word Festival, Theater of the Seventh Sister, Lancaster, PA.
May 6, 2012, 2:30PM: Performing poetry in Spoken Word Festival, Theater of the Seventh Sister, Lancaster, PA.
May 19, 2012, 10-4pm: Book Signing at “Marietta Day Annual Festival,” Market Street, Marietta, PA.
December 20, 2012, 8 PM: Cyclops Bookstore at 30 W. North Ave., Baltimore, MD 21201. March 31, Saturday, 11:30-2pm: Book launch at Martini Lounge, in Canton, OH: contact Audrey for an invitation. April 14, Saturday, 1-4pm: Book Fair at Hudson Library, in Hudson, OH. May 25, 2012, 6:30pm: Audrey Lavin is giving a presentation at the N. E. Mensa Association at the Lindsay’s Amber Restaurant, in Akron OH. May 25-26, 2012: Lavin is serving as a co-author of a presentation paper at an International conference in Novocherkask, Russia. May 31, 2012, Thursday, 12-1pm: Book talk, Massillon Rotary, place TBA, Massillon, OH. September 20, 2012, 6:30-8:30pm: Reading from Eloquent Tattoo at Authors’ Night, at the Glenmoor Bar, 4141 glenmoor Rd. N.W., Canton, OH. 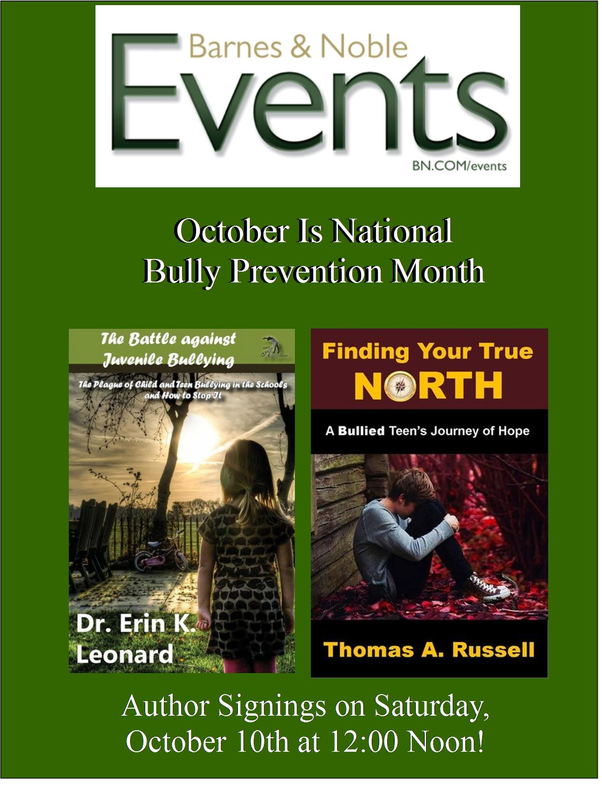 October 29, 2012, Saturday, 10:30-11:30: Book talk, College Club, Community Christian Church, in North Canton, OH. March 9, 2013, 2pm: Akron/Green Library on Massillon Rd., Green, OH. 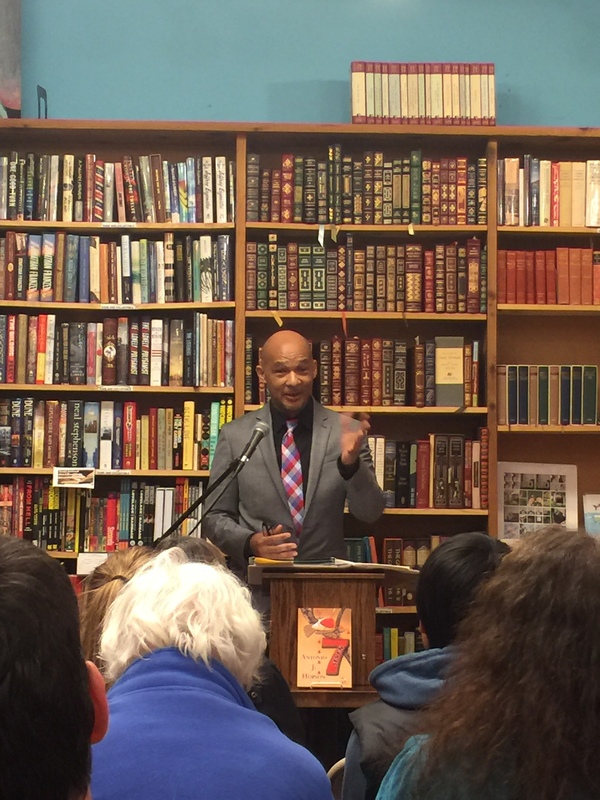 November 3, 2015, Tuesday, 7-8pm: “Antonio Hopson spins gentle legends and quiet love stories.” Third Place Books, 6504 20th Ave NE, Seattle, WA 98115. June 23rd, 2012, Saturday, 1:00 p.m.: Official book launch at Barnes & Noble Birdcage Walk, 6111 Sunrise Blvd., Citrus Heights, CA 95610, 916-853-1511. A book signing for The Seventh Messenger and for other books by Carol Costa will be held on July 9th, between 1-3 pm, at Bookman’s, located on 3733 W. Ina Road, Tucson, AZ. 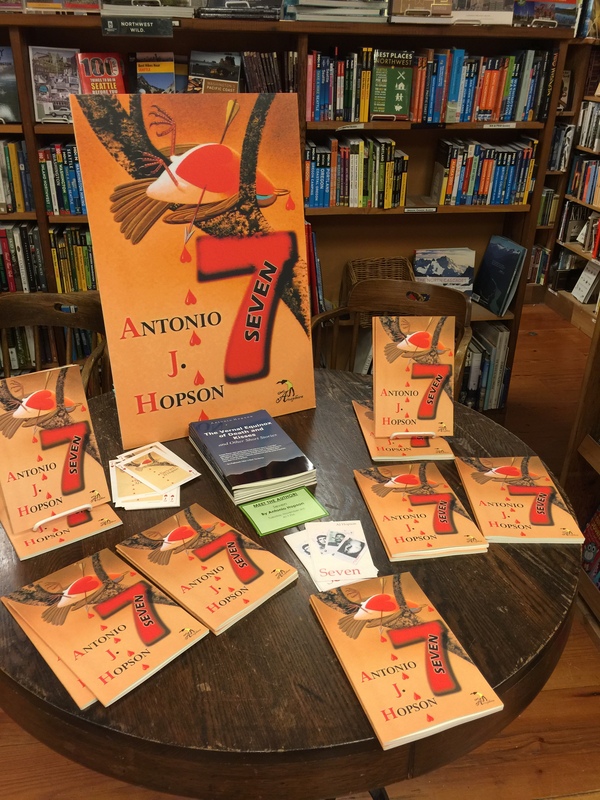 A book signing for The Seventh Messenger will be held on July 30th, between 1-3pm at the Mostly Books, located on 6208 E. Speedway, Tucson, AZ. 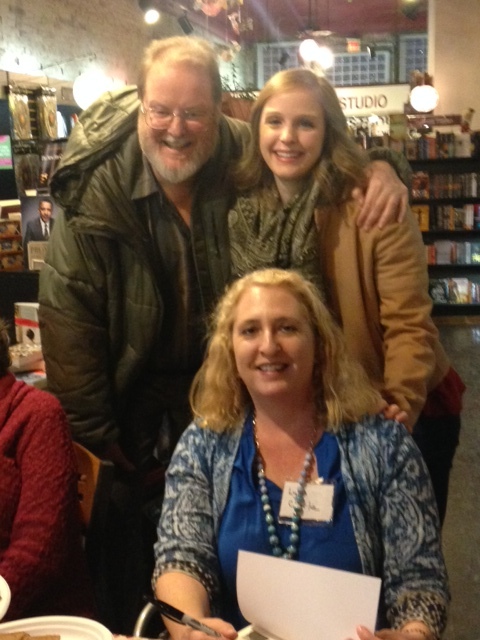 February 25, 2015 – Signing – Taylor Books, Charleston, WV. 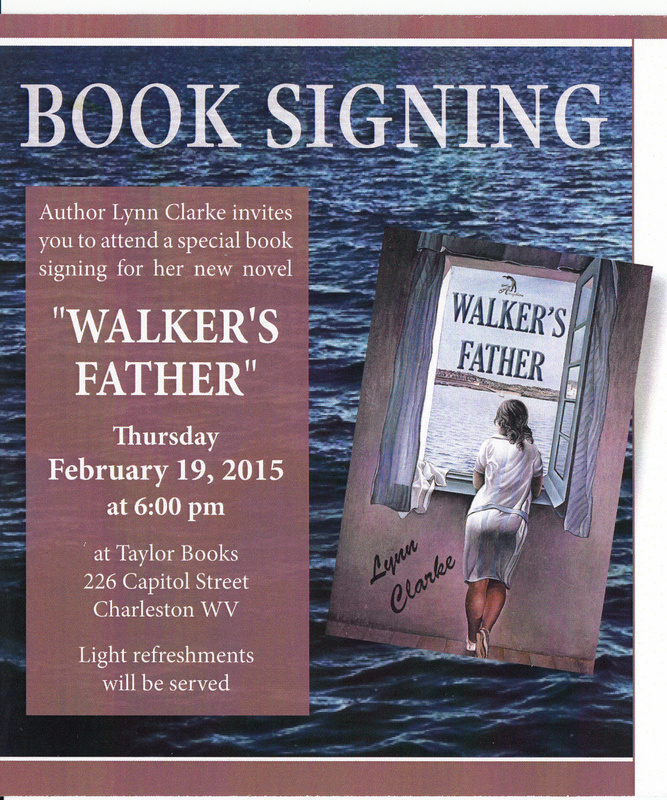 February 25, 2015, 6pm: Book signing held for Walker’s Father at Taylor Books in Charleston WV. Light refreshments will be served. More information can be found at: https://m.facebook.com/pages/Taylor-Books/83841413592. Article about the event in the Charleston Gazette: http://www.wvgazette.com/article/20150222/GZ05/150229957/1116. 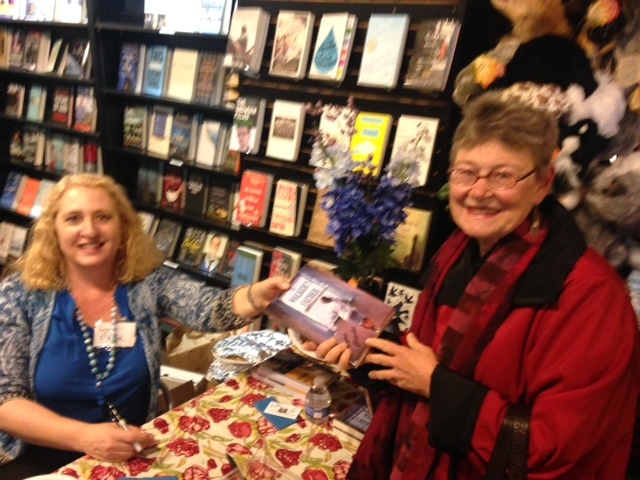 A book signing for Evidence and Judgment by Lynn Clarke, J.D., was held at the Taylor Books, located at, 226 Capitol Street, Charleston, WV 25301. The event took place on Tuesday, March 29, from 6 to 8 p.m. You can contact Taylor Books by phone at, (304) 342-1461. The store’s website is www.taylorbooks.com. It was a great success, with a large attendance. Lynn Clarke will give a talk about Evidence and Judgment on April 17 at the 9 a.m. Adult Forum at St. John’s Episcopal Church, 1105 Quarrier St., Charleston, WV 25301. The Adult Forum is a weekly hour long talk, held each Sunday on a current event or topic of interest. A book signing is scheduled for Evidence and Judgment at the Fourth Annual Art Expo, Presented by the Ladies’ Auxiliary, on May 1, 2011, Mother’s Day, at the B’Nai Jacob Synagogue, 1599 Virginia St., E, Charleston, WV 25311, between 11am and 4pm. For more information look online at www.ArtExpo2011.com. Books will be gift-wrapped as Mother’s Day gifts. Lynn Clarke will do a book signing on August 20, 2011, 11 a.m.-4 p.m., at Tamarack, The Best of West Virginia, in Beckley, WV, www.tamarackwv.com. 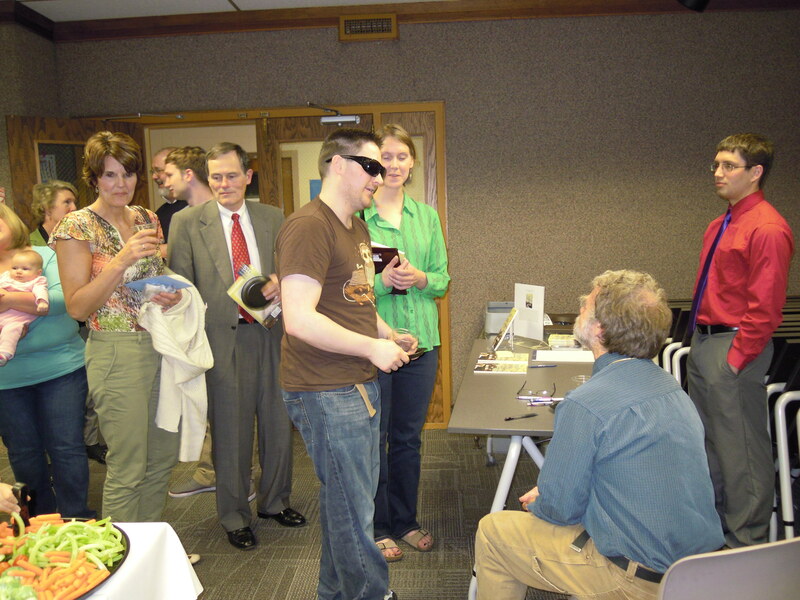 April 29-May 1, 2011: The Writer’s Weekend; Organized by: John Brantingham; Mt. San Antonio College, 1100 N. Grand Avenue, Walnut, CA 91789. Reading with Gerald Locklin, T. Anders Carson, Jo Scott-Coe, Paul Tayyar, Sunny Frazier, and others. October 21, 2011, 7-9pm: Marilyn Jaye Lewis will do a reading and signing from the Twilight of the Immortal at the Last Tuesday Society, 11 Mare Street, London E8 4RP, England. June 23, 2012, 2pm: Gloria will give a signing and reading from her novel at the Book Carnival, 348 S. Tustin, Orange, 714-538-3210. June 29, 2012, Friday, 2pm: Laguna Beach Public Library (CA) – Book chat and signing. January 20, 2012, 4-10pm: Louie’s Restaurant, 510 Cedar Lane in Teaneck, NJ. Cowen’s poetry will be accomponied by live music by the River Acoustic Band. October 6, 2012, Tuesday, 7pm: John Cowen will give a reading from his Anaphora book, Mathematics of Love at the Cross-Cultural Communications’ 40th Anniversary (1971-2011) Celebration (400 titles, 50 different languages). The lineup of poets includes: Stanley H. Barkan (poet/publisher), Maria Bennett, Sultan Catto, John Cowen, Jim Gwyn, Marilyn Mohr, and Bill Wolak. The event will take place at the Montclair Public Library, 50 South Fullerton Ave., Montclair, NJ 07042. It is a free reading, open to the public. Contact: Laura Boss & Maria Mazziotti Gillan Library: 973-744-0500. Macculloch Hall Historical Museum collaborates with the New Jersey Civil War Sesquicentennial Committee in mounting a major exhibit: “Gone for a Soldier:” Jerseymen in the Civil War, to run from November 6, 2011 to July 1, 2012 on Wednesdays, Thursdays and Sundays. The two organizations are using their expertise and connections to private and institutional collections to bring together an unprecedented amount of memorabilia chronicling the experience of New Jersey and her soldiers in the Civil War. The museum will offer lectures, book signings, and public programs to complement and enhance this major exhibit throughout the year. An exhibition catalogue will be available. Look for program announcements and updates on the museum’s website and Facebook page. For information, call the Museum weekdays at (973) 538-2404 MaccullochHallHistoricalMuseum, 45 Macculloch Ave., Morristown, NJ07960. The reading will take place in the Senior Center – middle, rear of the building. 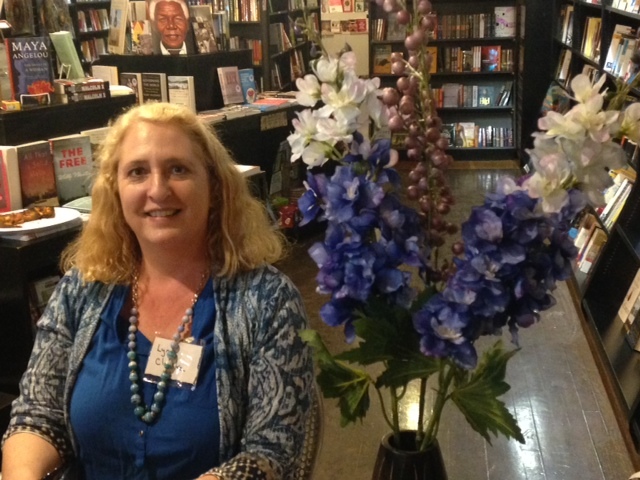 March 10, 2018, Saturday, 10-12pm, author Janet Ruth Heller will speak about “Nine Tips for a Successful Book Signing Event” for the Motown Writers Network Monthly Meet Up at the Detroit Public Library Main Branch at 5201 Woodward Ave., Detroit MI 48202. The talk will occur on the third floor in the Old Fine Arts Room. 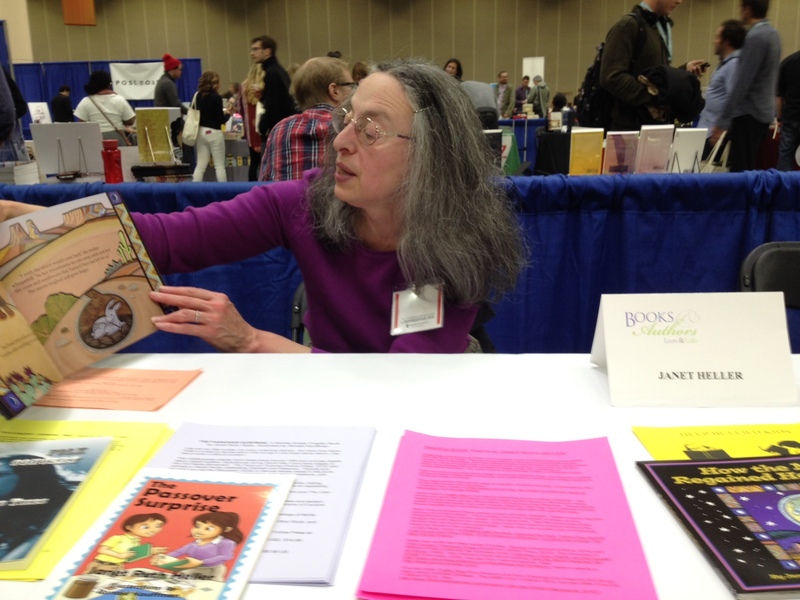 March 11, 2017, Saturday, 1-2:30pm: “Recent Multicultural Literature for Children and Young Adults” Panel with Janet Ruth Heller at Michigan Reading Association Conference at the DeVos Place Convention Center at 303 Monroe Ave NW, Grand Rapids MI 49503 in the Gallery Overlook G room. 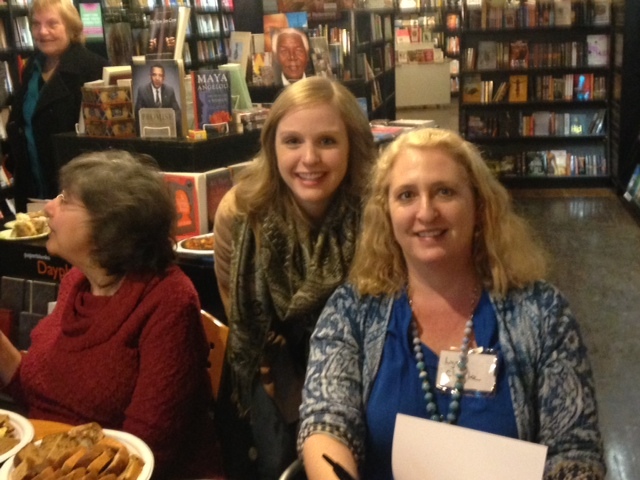 December 10, 2016, Saturday, 2-4pm: Authors Janet Ruth Heller, P. J. Lyons, and Erica Chapman will sign their children’s and other books at Schuler Books & Music at 2660 28th St. SE in Grand Rapids, MI 49512. July 9, 2016, Saturday, 11-12:30 p.m.: Editing & Publishing Workshop with Janet Ruth Heller at the Boston Public Library, Central Library in Copley Square, 700 Boylston Street, Boston MA 02116. Contact teen librarian Anna Draves at 617-859-2334 or use the website http://www.bpl.org/teens. June 2, 2016, Thursday, 2:15-5pm: Janet Ruth Heller will be reading her poetry about families and scholarly papers at the Writing the Midwest Conference, 219 S. Harrison Road, Michigan State University, East Lansing, MI. The conference website is http://www.ssml.org/symposium The phone number of the Kellogg Center is (517) 432-4000. 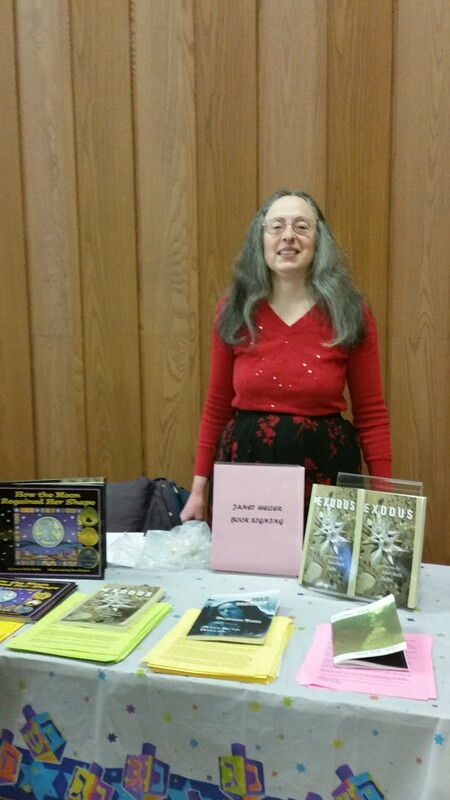 December 6, 2015, Sunday, 9:30am-1pm—Janet Heller autographs her six books at the Chanukah Bazaar at the Congregation of Moses in Kalamazoo, Michigan. December 12, 2015, Saturday, 10am-3pm—Janet Ruth Heller will read from and autograph her six books at the Local Writers Expo at the Portage District Library. Around 1:30 p.m., she will read from her books. She will also give advice about writing and publishing. The Portage District Library is located at 300 Library Lane/ Portage, Michigan 49002. For more information, please phone the Portage District Library at (269) 329-4544. December 12, 2015—Janet will autograph her books at Kazoo Books, 2413 Parkview Ave., Kalamazoo, Michigan 49008. For more information, please phone 269-553-6506, e-mail read@kazoobooks.com , or go to the website http://www.kazoobooks.com. November 13-14, 2014—Janet Heller spoke at the convention of the Midwest Modern Language Association at the Double Tree by Hilton Hotel Detroit-Dearborn. The conference theme is “The Lives of Cities.” Janet read her autobiographical essay “Growing Up on the Other Side of Lake Michigan,” which combines poetry from Folk Concert: Changing Times and prose, on November 13 from 2:15 to 3:45 p.m. She also discussed “Capturing Adolescence in Detroit: The Poems of Jim Daniels” from 2 to 3:30 p.m. on Friday, November 14. 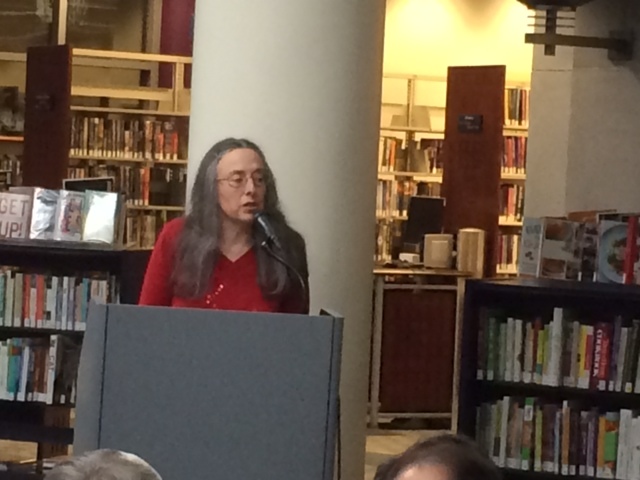 December 5, 2014, Friday–5 p.m. to 7 p.m.—Janet Heller read from her poetry books Folk Concert: Changing Times and Exodus at the Kalamazoo Public Library as part of a Friends of Poetry event. Janet also sold and autographed her books. Location: 315 S. Rose St., Kalamazoo MI 49007. This reading is part of Art Hop events in downtown Kalamazoo. December 13, 2014, Saturday, 10 a.m. to 2 p.m.: Janet Heller will read from and autograph her five books at the Local Writers Expo at the Portage District Library. Around noon, she will read from her books. She will also give advice about writing and publishing. For more information, please phone the Portage District Library at (269) 329-4544. December 14, 2014, Sunday, 10 a.m. to 1 p.m.: Janet Heller autographed her five books at the Chanukah Bazaar at the Congregation of Moses in Kalamazoo, Michigan. May 8-10, 2014—Janet Ruth Heller will be reading her poetry, presenting a scholarly paper about Jaimy Gordon’s novel Lord of Misrule, and autographing her books at Writing the Midwest, the annual conference of the Society for the Study of Midwestern Literature, in the Kellogg Hotel & Conference Center at Michigan State University, 219 S. Harrison Rd. in East Lansing, MI 48823. Janet’s paper about Lord of Misrule will be during the session scheduled for Thursday, May 8 from 4 to 5:30 p.m. Also, Janet will be reading her poetry on Friday May 9 from 1:45 p.m. to 3:15 p.m. Her books include the award-winning children’s book about bullying How the Moon Regained Her Shape (Sylvan Dell, 2006), her poetry books Traffic Stop (Finishing Line Press, 2011), Exodus (WordTech Editions, 2014), and Folk Concert: Changing Times (Anaphora Literary Press, 2012), and her book of literary criticism Coleridge, Lamb, Hazlitt, and the Reader of Drama (University of Missouri Press, 1990). The website is http://www.ssml.org/symposium The phone number of the Kellogg Center is (517) 432-4000. 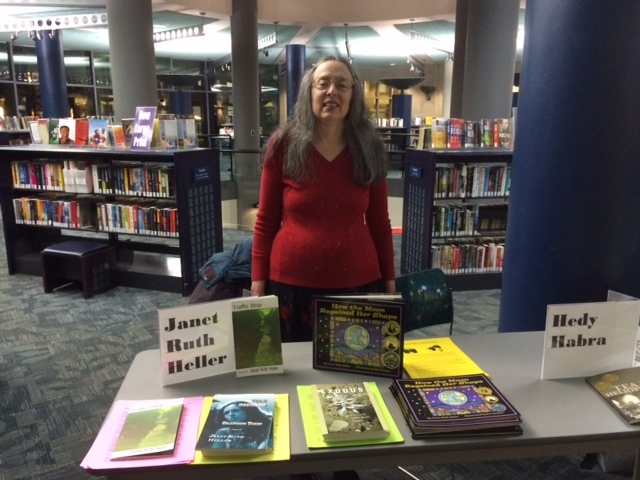 May 18, 2014, Sunday, 1:30 to 3:30 p.m. at the Brighton District Library, 100 Library Drive in Brighton MI 48116—Janet Ruth Heller will be talking about and reading from her new poetry books Exodus (WordTech Editions, 2014) and Folk Concert: Changing Times (Anaphora Literary Press, 2012). Janet will also answer questions and autograph her books. For more information, please e-mail Sarah Perry at sperry@brightonlibrary.info or phone her at (810) 229-6571, ext. 230. Tuesday, March 18, 2014, 7-8:45p.m. : “Fairytales, Legends, and Myths,” a poetry reading, will take place at the Portage District Library. Performers that evening are Kathleen McGookey, Hedy Habra, Lynn Pattison, Julie Stotz-Ghosh, Janet Ruth Heller, and Judith Rypma. The authors will be available to autograph their books. The sponsor of this event is Friends of Poetry. This event is free and open to the public. Refreshments will be served. Saturday, August 10, 2013—Janet Ruth Heller and other authors will perform and autograph their books at the Reading Rocks in Rockford Festival. Janet will be selling her award-winning book for children about bullying, How the Moon Regained Her Shape (Sylvan Dell), and her poetry books Traffic Stop (Finishing Line Press) and Folk Concert: Changing Times (Anaphora Literary Press). There will also be writing workshops. This festival is free fun for the whole family from 10 a.m. to 2 p.m. at 25 Squire Street in downtown Rockford, Michigan 49341, in Garden Club Park on the banks of the Rogue River. Sat. July 14, 2012 from 3 to 5 p.m.—Janet Heller, author of the poetry books Folk Concert: Changing Times (Anaphora Literary Press, 2012) and Traffic Stop (Finishing Line Press, 2011) and the award-winning book for children about bullying, How the Moon Regained Her Shape (Sylvan Dell, 2006), read her poetry during the Tribute to Barbara Gensler at Shorewood High School in Milwaukee, Wisconsin. Gensler retired after teaching English and serving as Drama Director for 47 years. Thirty alumni participated in the Tribute performances, which raised $13,000 to support theater at the high school. Wed. August 1, 2012 from 6 to 8 p.m.—Janet Heller, author of the poetry books Folk Concert: Changing Times (Anaphora Literary Press, 2012) and Traffic Stop (Finishing Line Press, 2011) and the award-winning book for children about bullying, How the Moon Regained Her Shape (Sylvan Dell, 2006), will be reading her poetry and autographing her books during the Second Annual Air Poetry Reading at Kazoo Books, 2413 Parkview Ave., Kalamazoo, Michigan49008. Six other poets will also read from their work. For more information, please phone 269-553-6506, e-mail read@kazoobooks.com, or go to website, http://www.kazoobooks.com. Friday, October 26, 2012 from 9am to 3pm.—Janet Heller will be reading from and autographing her new poetry book Folk Concert: Changing Times (Anaphora Literary Press, 2012) at the Michigan College English Association Conference in Grand Rapids. She will also present the paper “Obsessions and Bipolar Disorder in Jaimy Gordon’s Lord of Misrule.” Heller is the President of teh Michigan College English Associaion. Location: Eberhard Center of Grand Valley State University, 301 W. Fulton St., Grand Rapids MI 49504. For more informaiton, please see http://www.michcea.com/mcea/Annual_Conference.html. Thursday, November 1, 2012—Janet Heller will be reading from, speaking about, and autographing her new poetry book Folk Concert: Changing Times (Anaphora Literary Press, 2012) and her other books Traffic Stop (poetry, Finishing Line Press, 2011), Coleridge, Lamb, Hazlitt, and the Reader of Drama (literary criticism, University of Missouri Press, 1990), and How the Moon Regained Her Shape (award-winning children’s book about bullying, Sylvan Dell, 2006, new edition 2012) at Kankakee Community College, 100 College Drive, Kankakee, IL 60901. Janet Heller will be speaking for the Introduction to Poetry class from 11 a.m. to 12:15 p.m. She will also sign books and speak for the whole community from 6:15 p.m. to 8 p.m. For more information, please see Upcoming Events at www.kcc.edu. May 9-10, 2013: Janet Heller will be reading her poetry, having her play performed, and autographing her books at Writing the Midwest, the annual conference of the Society for the Study of Midwestern Literature, in the Kellogg Hotel & Conference Center at Michigan State University, 219 S. Harrison Rd. in East Lansing, MI 48823. Janet will be reading her poetry on Thursday May 9 from 12:30 p.m. to 2 p.m., and her play The Cell Phone will be performed and discussed on Friday May 10 from 10:15 a.m. to 11:45 a.m. Her books include the award-winning children’s book about bullying How the Moon Regained Her Shape (Sylvan Dell, 2006), her poetry books Traffic Stop (Finishing Line Press, 2011) and Folk Concert: Changing Times (Anaphora Literary Press, 2012), and her book of literary criticism Coleridge, Lamb, Hazlitt, and the Reader of Drama (University of Missouri Press, 1990). The website is http://www.ssml.org/symposium The phone number of the Kellogg Center is (517) 432-4000. May 11, 2013, Sat., from 2 p.m. to 4 p.m.: Janet Heller will be selling and autographing her books at the Flint Public Librarys Book Expo for authors of books for children. Her books include the award-winning children’s book about bullying How the Moon Regained Her Shape (Sylvan Dell, 2006), and the poetry books Traffic Stop (Finishing Line Press, 2011) and Folk Concert: Changing Times (Anaphora Literary Press, 2012). The Flint Public Library is at 1026 E. Kearsley St., Flint, MI 48502. The phone is 810-249-2170. The website is www.fpl.info. March 27-30, 2019: Anna Faktorovich moderated the “Elements of Small Press Success” and “Anaphora Literary Press Reading” featuring authors: Howard W. Robertson, William Luvaas, Peter Schneider and Mark Spitzer (Bookfair Stage 1, 3/30, 3-4:15pm). Anaphora exhibited at booth (8082) at the Association of Writers and Writing Programs (AWP) Conference at the Oregon Convention Center in Portland, OR. April 21-22, 2018, 10am-6pm: Anaphora exhibited at the Los Angeles Times Festival of Books at the University of Southern California, University Park campus: Los Angeles, CA 90089: free and open to the public. April 6, 2018: 9am-12pm: Faktorovich led a collaborative space discussion and presented a digital poster session at the Texas Library Association Conference in Dallas, TX, Kay Bailey Hutchison Convention Center. June 28, 2018, 7pm: Faktorovich presented on “How to Market and Sell Books to the World or a Specialized Marketplace” at the Rose Park Senior Center, 2625 S 7th St., Abilene, TX 79605. 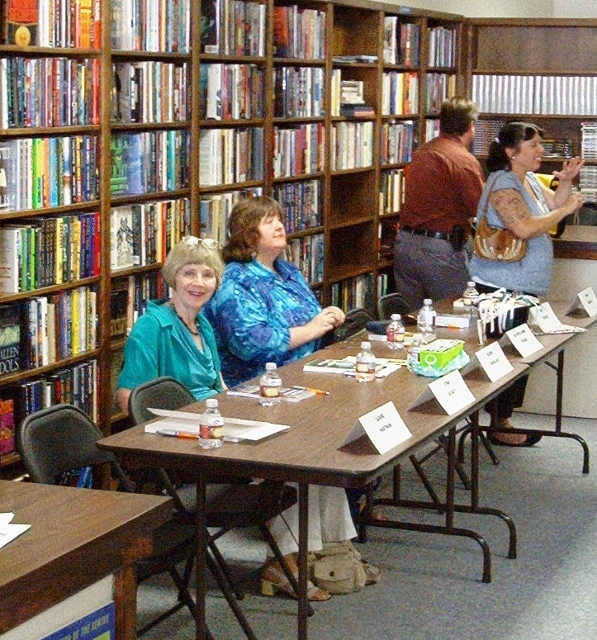 Abilene Writers Guild. November 4–6, 2016: SAMLA Convention, Jacksonville, FL. Faktorovich will present a paper, “Gulliver’s Travels as Subversive Political Propaganda under the Cloak of Utopia,” in the “Rejection, Digression, and Diversion: Rethinking Canonical Works by Early-Modern to Modern Major Authors” session: https://samla.memberclicks.net/future-conferences. June 23-28, 2016: American Library Association Conference: Orlando, FL: http://iebms.heiexpo.com/ala/ALA16Prospectus.pdf. Sponsored by Ralph Crosby, founder of Crosby Marketing Communications, and a forthcoming Anaphora author. 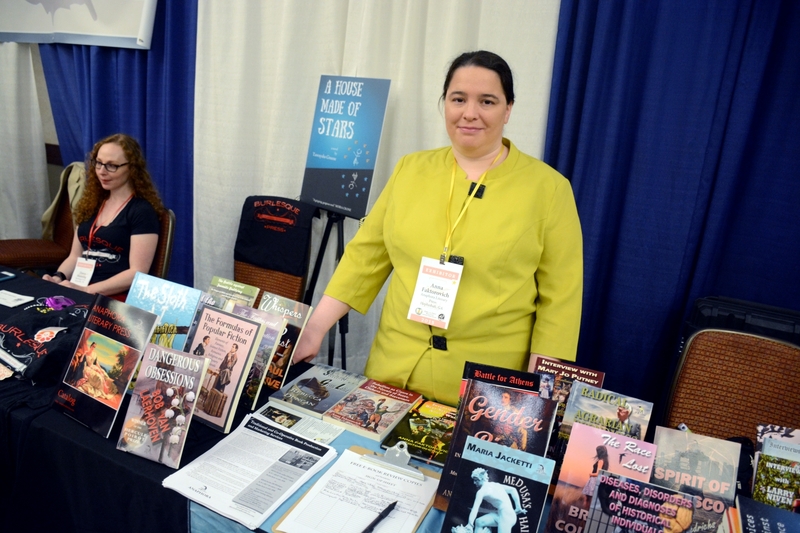 Opportunities available for authors to attend as a table-manner for free, run a giveaway of their book to be featured in ALA’s marketing booklets, present in a session as an author or scholar, and the like. Email the Director at director@anaphoraliterary.com for details. Anna Faktorovich at the Anaphora SIBA BookExpo table, by David Leone. 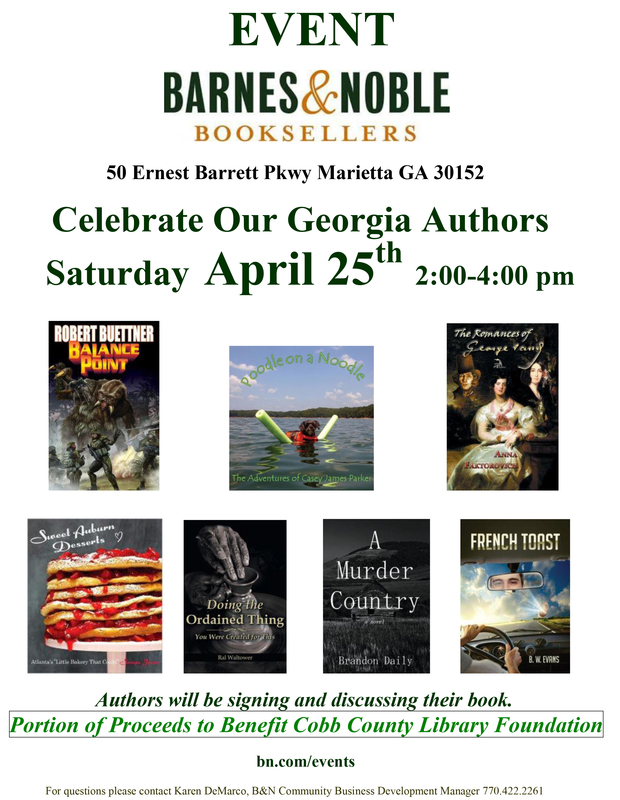 April 25, 2015, 2-4pm, Barnes & Noble, 50 Barrett Parkway, Suite 3000, Marietta, GA 30066: Anna Faktorovich did a reading as part of the Local Author’s Day event. April 10-12, 2015: Janet Heller and Laura Madeline Wiseman manned an Anaphora booth at the AWP convention, signing some of their books. March 22, 2015, Sunday: Anna Faktorovich will present on her novel, The Romances of George Sand, Virginia Festival of the Book: Alliance Française de Charlottesville: Virginia Foundation for the Humanities, 145 Ednam Drive, Charlottesville, VA 22903, http://www.vabook.org/index.html. January 13, 2015, Tuesday, 7:30pm: A comedy club voted as “The Best” in Atlanta 3 years in a row, Laughing Skull Lounge, http://laughingskulllounge.com/Open-Mics, will include Anna Faktorovich at their Open Mic show. November 21-23, 2014: Anna Faktorovich and Kevin Daley (an Anaphora author) were available for book signings at the Anaphora table in the exhibit area at the Miami Book Fair International: 300 NE 2nd Ave, Miami, FL 33132: http://www.miamibookfair.com/events/. November 7th-9th, 2014: Anna Faktorovich will be hosting 3 tables at SAMLA’s 86th Annual Conference at the Atlanta Marriott Buckhead Hotel and Conference Center at 3405 Lenox Road NE, Atlanta, GA, 30326: https://samla.memberclicks.net/conference. October 25, 2014, 8am-10pm: Anna Faktorovich will be available to answer questions about Anaphora and to sign/ sell her books at a table among exhibitors at the South Carolina Writers’ Workshop: Hilton Myrtle Beach Resort: 10000 Beach Club Drive, Myrtle Beach, SC 29572: http://myscww.org/conference/schedule-of-events-ii. November 16, 2013, 1-2pm: Anna Faktorovich will do a reading and signing from her self-illustrated children’s book, “The Sloths and I” at Mostly Books, 6208 E Speedway, Tucson, AZ : http://www.mostlybooksaz.com/book/9781937536299. October 30, 2013, 4-5pm: Anna Faktorovich was featured on CJSF Radio, “Women’s Radio Program,” Burnaby, BC (Canada). Interview with Nadine Chan-Ying on the “Gender and Genre” survey. You can listen to this show at http://cjsf.ca/pguide/grid/description.php?ID=111. March 9, 2013, 4-5:30pm: Anna Faktorovich will present in the “Journal vs. Press Publishing and Editing” session at the Tucson Festival of Books (AZ). February 18th, Monday, 6 PM: Victor Kai-Rogers and Susana H. Case are reading at the Phoenix Reading Series @ The Yippee Museum Café, 9 Bleecker Street, New York, NY. January 5-6, 2013: Anna Faktorovich will present in the Council of Editors of Learned Journals “Chat with an Editor” session of the Modern Languages Convention in Boston, and will receive the MLA Bibliography award. 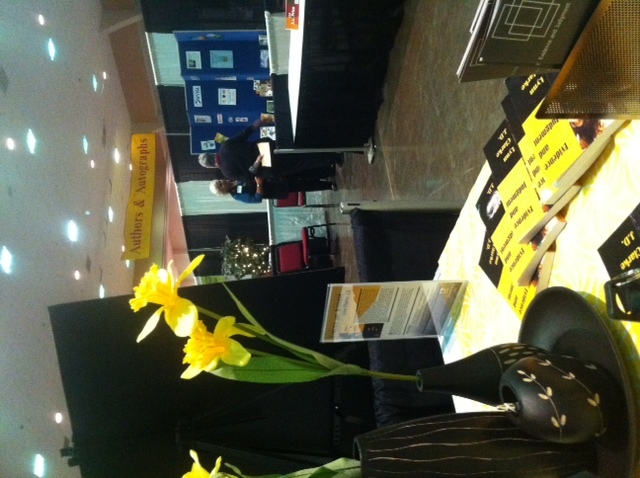 October 22-23, 2012: Anaphora Literary Press had a booth at the West Virginia Book Festival. Lynn Clarke was the Publicist manning the booth. Lynn was supported by a great 6-foot “Anaphora” sign, and gave out pens, bookmarks, business cards and other marketing materials with Anaphora’s information on them. T. Anders Carson did a reading and signed books between 12-4 p.m. on Saturday. January 5-8, 2012: Anaphora Literary Press attended the Modern Languages Association Convention, held in Seattle. The Director, Anna Faktorovich, PhD, presented her research on political Scottish linguistics in the Celtic Discussion Group session. March 27, 2012, 5-6pm: Anna Faktorovich, PhD, did a poetry reading in the Learning Communities series at the Middle Georgia College, Presidential Conference Room. April 27, 2012, evening: Poetry reading at Small World Books at 1407 Ocean Front Walk, Venice Beach, CA. April 28, 2012, 9am-5pm: Anna Faktorovich, PhD, is serving as a Guest Speaker at the Mt. SAC Writer’s Weekend in CA – 1100 N. Grand Avenue, Walnut, CA 91789 • (909) 274-7500. April 28, 2012, evening: Poetry reading at Roni’s #34, 9029 Florence Ave, Downey, CA. May 17, 2012, 6:30-9pm: Anna Faktorovich, PhD, is doing a poetry reading at the Charis Bookstore: 1189 Euclid Avenue Northeast, Atlanta, GA 30307. 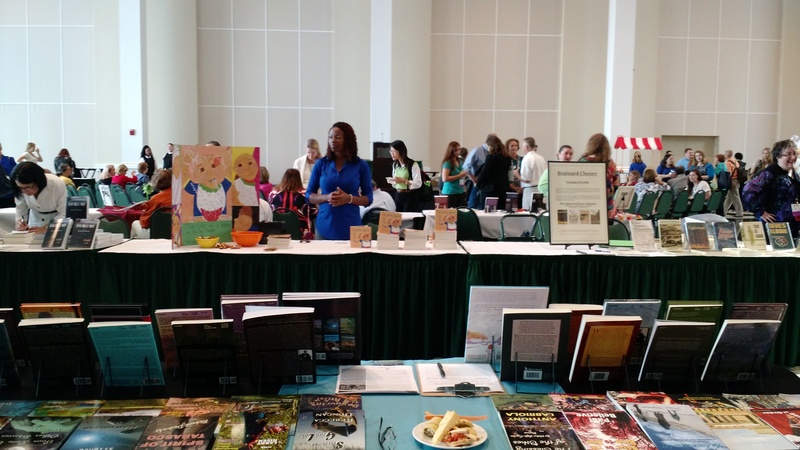 October 13-14, 2012: Anaphora authors will once again participate in the West Virginia Book Festival. The schedule of readings/ signings at the Anaphora table, during thte Fest, will be as follows: Sat. Oct 13: 9-11am: Lynn Clarke; 11-12pm: Rainer J. Hanshe; 12-2pm: Anna Faktorovich; and 2-6pm: Rainer J. Hanshe. Sun Oct. 14: 1-3pm: Lynn Clarke. Printed copies of the updated catalog can be purchased for $10 by clicking on one of the following links: CreateSpace or Amazon.